Latest News: Re-Registration open for July-2019 Session. Last Date for Re-Registration is 31st May 2019. इग्नू में री रजिस्ट्रेशन फॉर्म भरने की प्रक्रिया शुरू हो चुकी है | All those students of Indira Gandhi National Open University who took admission in July 2018 session MUST fill the re-registration form irrespective of the fact if they’re failed or passed in the examination. On onlineadmission.ignou.ac.in/onlinerr, you can check General Instructions, Form filling steps & programmes available. These programs (PGDHRM, PGDFM, PGDOM, PGDMM AND PGDFMP) are available in offline mode, Interested students may submit an application in concerned Regional Centre. Re-registration 2019 Form only available ONLINE for BA, B.Com, B.Sc, BTS and BSW programmes at present. 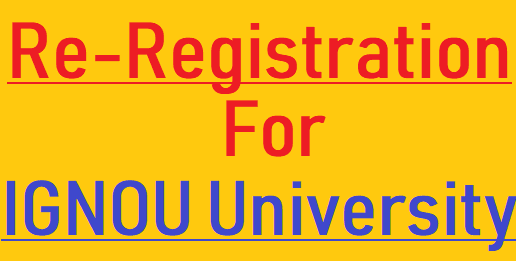 IGNOU Re Registration 2019 (July) Last Date, Status, Form – फॉर्म शुरू: Online Status, Last Date: What Are Rules & Validity? Fees Online Payment, Form Annexure. Re-Admission Application. The candidate who completed the IGNOU Re-Registration process can simply check out the Re-Registration status via an online platform. The IGNOU online authentic portal website allows the aspirants who already registered on the legitimate web address can know the status related to Re-Registration. It is more important to ensure the Re-Registration status of examinations because of success or not. It confirms you to engage in the convocation celebration so bear in mind and doesn’t hesitate to get the examination of June register along with their name or name wise in the authoritative forum. Contestants need to access the Re-Registration IGNOU website. The fresh homepage of IGNOU shows diverse instructions and check out the IGNOU Re-Registration option. The Re-Registration of term end exam fee is must for all the candidates to pay the amount for the convocation Rs.600 each certificate. The contenders of modular programmes such as MMCA, M.COM, an MBA need to submit the application fee and take the entire certificates while qualifying. For further query clarify with the departmental websites and complete the task easier and quicker with the online IGNOU web page and make sure all the time. The Indira Gandhi National Open University gladly welcomes all the students who are ready to engage in the convocation need to register in an effective manner. The convocation Re-Registration is apt for all 1st, 2nd and 3rd-year candidates and needs to know the last date. The complete details about the IGNOU Practical Examination Result convocation celebration are accessible on the official website of IGNOU. Stay with the IGNOU official website and receive more updates every time. The candidates who enter into the official website can do the Re-Registration and finish it quickly without wasting much time. Before you go to register on the website make sure the right name and start Re-Registration in an efficient manner. Apart from this, here’s all you need to know about Indira Gandhi Open University in 2019. Re-Registration Procedure in IGNOU is only for those candidates who’re going to take admission in 2nd Year or 3rd Year from July onwards. IGNOU Re Registration 2019 (July) Last Date, Status, Form – फॉर्म शुरू. sir, i am B.COM final year student of IGNOU.Mera june TEE ke liye online registration ho chuka h but i need some changes in my exam subject code .so,please tell me how can i proceed for that.please tell me sir. HOPE FOR A POSITIVE RESPONSE FROM YOU. I took my first admission in July 2017 for 1st year n gave examination in dec 2018 again n I did reregistration for 2nd year in July 2018 . I will be appearing for my 2nd year exam in dec 2019. So when will I have to fill up my form for 3rd year to give examination of the same in July 2020 . Hoping for you reply . sir mera exam centre code wrong fill ho gya h …kya m ESE change kra skta hu ? Later on, if there is an option to fill the exam form is there. Sir I took admission in B.Com in Jan 2014 and admission expires in Dec 2018… Now when I m applying for re-admission, a pop up message displaying screen stating that, “you are not eligible to register for this session'”. Plz guide me so that I can take admission without wasting my time..
Sir, I m in Army. I took admission in B.com in Jan 2014 and admission is expired in Dec 2018… Plz guide me, should I eligible to take re-admission to complete my graduation. I left 3 subjects to complete graduation… Regards Samar…. Take re-admission and complete your graduation on time. But, Sir when I m entering my enrollment number for re-admission, a pop up message box open on screen stating, ‘You are not eligible to register for this session’. Please wait for the next date. 3 – kya mai 2 nd year ka admission lekar is year december me exam dekar phir June me 2 nd year ka pg de sakta hun ..
2. July 2019 mein re-registration hoga. 3. Don’t have an idea regarding the third question. Please visit your regional centre for this. I am student of Mcom.. I have not completed. Iboo4 paper.Further my admission validity had ended in June 2018.Now I have applied for re registration in said paper.Npw please guide me how to check registration status..
Sir Mene 32st convocation ka degree ka form fill nhi kiya and last date is over now. So what can I do now please tell ????? Visit your respective study centre Shruti, and ask the staff out there if any solution exists for this problem. By the end of the next week, All results of IGNOU will be updated. Sir i have taken admission in history m.a in 2016 june so iam 2016-2021 student. I have not completed my 1st year till no and i have not taken the admission for 2nd year also. Now my study centre told me take the admission for 2nd year. Can i take the admission now for 2nd year.. what should i do now? Pease help me. Sir I m in Army… I took admission in B.Com in Jan 2013 and admission expires in Dec 2018. My Enrollment Number is 124585117. when I was entered my enrollment number for re-admission, a pop up message box open on screen stating, ‘You are not eligible to register for this session’. What should I do?? Kindly guide me… Am I eligible for re-admission in same course?? I enrolled in 2014-2019 june. I have paid 2 yr fee. Due to personal reasons i could not complete my MSO course till now. Out of 8, 7 subjects are left. Can I appear in june 2019 exam. What should I do?? If is it possible you may send me email as well. You’ve enrolled from 2014 to 2019? I am MCA Student . Unfortunate I couldn’t apply for MCA 4th Se-mister re- registration for Jan 2019 session . Please guide that may I apply 4th & 5th Se-mister together …? Re Registration krne se kaam nahin chalega. Exams pass bhi krne pdte hain. 6 saal tk kya kiya? iska to ek hi solution hai ki Term End Examination dubara do ab June 2019 mein.